Driving Tunes is rated 3.9 out of 5 by 10. Dimension (in) 5.85" x 8.75" x 2.75"
Rated 4 out of 5 by Msantos from Great toy for when on the road This is great when in the car. My son love playing with it when we driving around running errands. Very simple toy but gets all of my son attention. Rated 2 out of 5 by ATL008 from Not the greatest All in all, this is not my favorite toy. It doesn't function well and I'm confused by some of the characteristics and features. Here are some notes: - The "windshield" is a cheap sticker that has a cartoon sun and dog appearing in a real life picture of a suburban street. The picture itself doesn't look good and the entire sticker is already peeling off. - The 123 buttons really don't work some of the time. Also I'm confused as they are Green, Yellow, and Red, I assume to be like a street light, but the green is at the top and red is on bottom. So that's kind of off if it's trying to follow a theme. The actual white numbers printed on the shapes are fading off. - The wheel used to click when turned but it no longer does - There is a handle with a random shape dangling on it which I guess is supposed to serve as a teething toy? Maybe it's supposed to resemble a key to follow the theme but that's really a stretch. I think my baby enjoys the music and lights, but I don't feel like this toy is great quality or even makes much sense. Rated 3 out of 5 by mollyt from Great Sounds! My 1 year old enjoys this toy. He loves to turn the steering wheel. Rated 5 out of 5 by MrsLiu from Great toy! 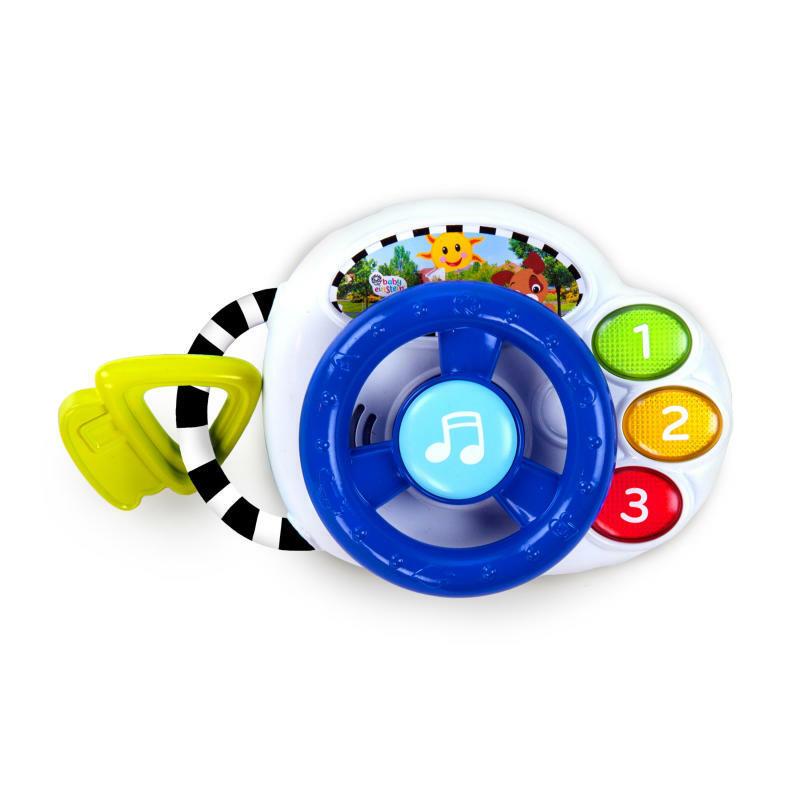 We had a similar toy but it was used for home only (too bulky) and the sounds were limited but this one is small enough for our daughter to take along with her anywhere she goes and it has more music than other ones and she really likes the steering wheel! Rated 4 out of 5 by Rheabee from Great activity toy for travel We have found this to be a great option to help our back seat driver feel like he's doing what we are doing (driving). Definitely helped us on our last car trip. Rated 4 out of 5 by MariaAlbarran from LO loves using it in the car LO likes taking in the car while and pretend he is driving the car too. He is fully engaged by the sounds and lights.